Born: February 12, 1798 in Bridgewater Ma. Died: March 17, 1846 at 48 yrs. 1. William Thomas Hooper; (September 28, 1831 – March 6, 1860); William T. died in Middleboro Ma. at 28 yrs. ; He was unmarried. 2. Susan Cary Hooper Davis Mesroll; (January 29, 1833 – October 11, 1884); Married Hiram G. Davis (? – 1857) (Phillip Davis & Mary (–)) on September 14, 1854 & married (2) James Mesroll, Jr. on May 1, 1871. 3. Cyrus A. Hooper; (March 20, 1836 – December 19, 1873); Cyrus was unmarried. 4. 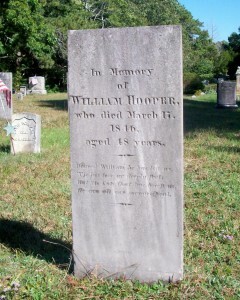 Benjamin Henry Hooper; (January 6, 1838 – January 25, 1863); Benjamin was unmarried. 6. Mercy Ann Hooper Harvey; (June 15, 1843 – April 9, 1887); Married James Barton Harvey (Barton P. Harvey & Hannah W. (–)) in Raynham Ma. on September 1, 1868.